The weeks are buzzing along and the entries keep on coming. Here are the finalists for week 5. Number 1 is a nice logo but compared with all of the other finalists and creative entries it loses it oomph. For number two I don’t get the blue item on the left. Maybe I need to squint my eyes or something but its too obscure like it came from a logo kit at office depot. Number 3 really embraces the connection between t-shirts and computers/internet as well as the ability to create your own. I like the concept but the green circle/seal style is really overused in web 2.0 designs for text like “beta” or whatever. Number 4 below is more obscure/artsy and brings together the fun and community of Spreadshirt. I look at it two ways, one that multiple people coming together to create a t-shirt OR I look at and wonder why those two little people aren’t wearing t-shirts. Number 5 is a different version of a design we saw last week and it is much improved without the tag. I really like the hands the come to mold or bring together the t-shirt. The multiple hands could represent the Spreadshirt employees or community to make the t-shirt creation possible. Well whatever it might mean to others I think it has definitely earned its place in the finals. Lastly, number 6 with the quasi-talk bubble looks like it got picked cause its just a little bit different. I am not sure what the story with the circle off the eye. So those 6 were chosen out of the following designs below. Do you think they all deserved to be there? Also, as always, you can click the image below to see it bigger but it may take a while to load so be patient. For more info and graphics check out the OLP Week 5 in review and the Week 5 shortlist. 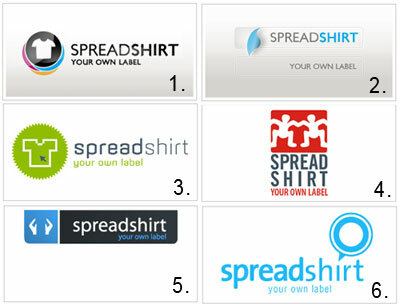 i like number 2, the idea of a label that is easily “spread” and applied even onto the shirts themselves is refreshing. i can see this idea nicely refined into a tshirt becoming this “label” or “sticker” instead of just a rectangular tab. nice though. ← T-Shirt Contests Web Sites – Will the Contest Trend Continue?